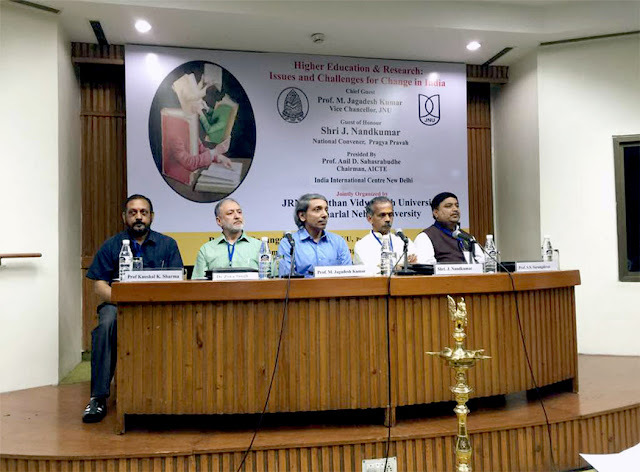 During the programme, Prof. M. Jagadesh Kumar, Vice-Chancellor of JNU was the Chief Guest who emphasized that we have to do major changes in our education so that our students may become time and market relevant. Sh. J. Nand Kumar, National Convener, Pragya Parvah, who graced the occasion as guest of honour said that westernization of education is damaging our culture and values, we must stop it and think beyond the time. The event was jointly organized by Jawahar Lal Nehru University and Janardan Rai Nagar Rajasthan Vidyapeeth University, Udaipur at India International Centre, New Delhi. A large number of eminent educationist, scholars, teachers and policy makers from all over India participated in it & presented their views and discussed issues threadbare. All of them emphasized the need for quality education and the change in existing education system.